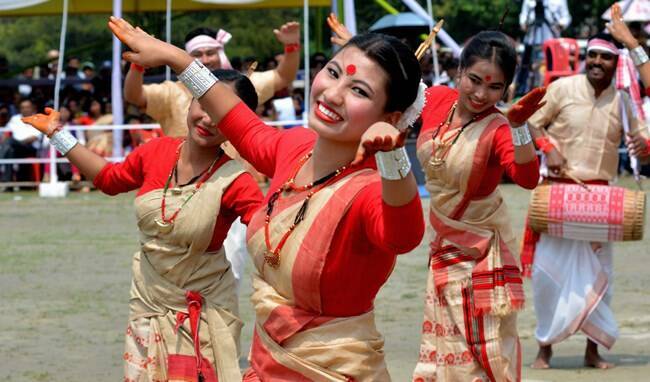 Happy Bihu 2019: This year Rongali Bihu will be celebrated on April 14. Derived from the word bishu, Bihu means 'to ask for prosperity from the Gods during the harvest season'. Happy Bihu 2019: Rongali Bihu, also known as Bohag Bihu, is the Assamese New Year wherein farmers thank the lord for the successful harvest and welcome the spring season. Observed at almost the same time as Baisakhi in Punjab, Poila Baisakh in Bengal, Puthandu in Tamil Nadu and Vishu in Kerala, this year, Rongali Bihu will be celebrated on April 14. Derived from the Sanskrit word bishu, which means ‘to ask for prosperity from the Gods during the harvest season’, it is one of the most important festivals in Assam. A time of zest, joy, and feasting, it is celebrated for seven days, wherein each day holds a special significance. The first pinnacle phase is called Raati Bihu wherein women gather beneath an ancient tree or an open field, surrounded by burning torches. The participation of men is mostly ceremonial wherein they play Pepa (buffalo hornpipe) or Bholuka Baanhor Toka (a musical instrument made of split bamboo). This is followed by Bali Husori, where Bihu dances are organised by the young. The main celebration starts on the day of Goru (cow) Bihu, where livestock is washed with a combination of symbolic herbs like black gram and turmeric paste, whipped litsea salicifolia, and pieces of bottle gourd and brinjal. After the bath, they are decorated with new harnesses and garlands. The second day is known as Manuh (human) Bihu where people take a bath with black gram and turmeric paste, wear new clothes, seek blessings from the elders and exchange gifts. A Gamusa (an indispensable and symbolic piece of cloth) is presented to each other as a token of friendship, love, and warmth with each other. A traditional Bihu dance is performed by both men and women, which is the high point of the festival. The third day is called Gosai (God’s) Bihu. People worship idols after cleaning their homes. The rest of the celebrations take place on Kutum Bihu, Senehi Bihu, Chera Bihu and Mela Bihu. Sweet dishes that include pitha (rice cake), laru/ladoo (made of rice and coconut or black sesame seeds), and savoury dishes like khaar and xaak make for an essential part of the festivity.